As an online retailer if you have chosen 3dcart, the top shopping cart solution provider, then kudos to you! 3dcart vouches to offer you “The all-in-on-ecommerce solution’ so that taking business notches higher becomes a simplified process for you. It is good news for the 3dcart retailers who are seeking for maximum visibility of their business across 200+ shopping channels that it can be a reality now when you shake hands with ChannelSale. In this competitive era, you need multi-channel exposure and it is only ChannelSale that can offer you the due support when you want to make your multi-channel marketing campaign, a successful one! 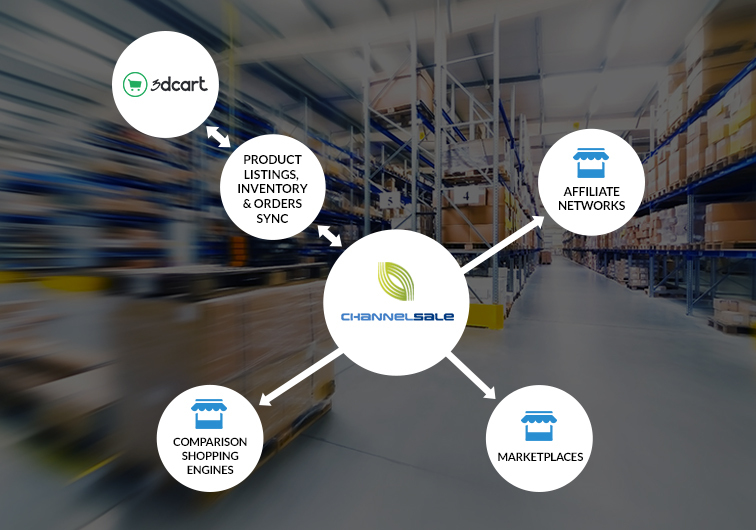 Integration with ChannelSale, can help you reap the rewards out of this web store solution. From top online Marketplaces like Amazon, eBay, Walmart, Sears, Rakuten, Newegg, Wayfair, Overstock, etc., To Comparison Shopping Engines like Google Shopping, Nextag, PriceGrabber, Shopzilla, To Affiliate Networks Commission Junction, Share A Sale, Link Share - integrate with these big names by putting your trust on ChannelSale. Hire our 3dcart plugin services at affordable rates. Get 2 comparison shopping engines Sort Price, Bing Shopping setup costing $198 for free with 3dcart plugin integration with no recurring fee for first month, followed by $149 per month for upto 10k sku’s, add $20 per month for next additional 5k sku’s. ChannelSale can retrieve your product listings via API-XML from 3dcart and further synchronize them across all the top online marketplaces, comparison shopping engines and affiliate networks. Real time inventory updates from / to 3dcart plugin – avoids over-selling and under-selling issues. For example - If a product sells on Amazon, the updated remaining quantity in hand would reflect in your ChannelSale account and further on 3dcart. Centrally manage all orders. Export 3dcart orders to third party order fulfillment platforms / dropshipper’s, Fulfilled by Amazon, or to suppliers.